Abstract: Buddy is a 15 year old neutered male domestic shorthair feline with a primary presenting complaint of hind limb weakness. On initial exam he had a crouched hind limb stance and a choppy, ataxic hind limb gait. Myofascial exam revealed triceps and cervical trigger points, severe lumbosacral pain, and coxofemoral pain. He was initially being treated twice weekly with acupuncture and laser therapy, and now is maintaining good results with once weekly treatments. With each visit Buddy has waxing and waning improvement in his trigger point discomfort, lumbosacral pain, and ambulation, but the client does feel that he is consistently stronger in the days following each session. Buddy is a 15 year old neutered male domestic shorthair with an approximately one month history of hind limb weakness. His owner had noticed progressive hind end weakness with the hind legs splaying out on the wood floors, difficulty jumping up, and reluctance to use the stairs. Buddy has a concurrent history of chronic kidney disease, inflammatory bowel disease, hyperthyroidism, and cardiac disease. His medications include methimazole, aluminum hydroxide, omeprazole, subcutaneous fluids, Adequan injections, prednisolone, and FortiFlora. There has not been any recent trauma. Buddy lives in a split-level home with multiple staircases and hardwood flooring. Buddy was quiet, alert, and responsive. He was in thin body condition with moderate diffuse muscle atrophy. His stance was crouched in the hindlimbs and he had a choppy, ataxic hind limb gait with intermittent loss of left hindlimb balance. He had delayed hind limb proprioception and normal spinal reflexes. Buddy had trigger points at the right sternocephalicus muscle, bilateral triceps musculature, and sartorius muscles bilaterally. Buddy resisted extension of the hips and there was decreased coxofemoral range of motion bilaterally. He showed pain (twitching tail and moving away) with even gentle palpation at the caudal lumbosacral spine. Buddy’s treatment was primarily focused on the lumbosacral and coxofemoral regions where he appeared most painful. Since he was likely off-loading his weight onto the fore limbs, it was not surprising to find trigger points at the triceps and cervical musculature. We addressed these trigger points individually as they were palpated, and these varied from treatment to treatment depending upon each particular day’s myofascial exam. We also included some distal and immunomodulatory points to address his underlying chronic kidney disease and inflammatory bowel disease. We are treating Buddy for suspected lumbosacral intervertebral disc disease, coxofemoral osteoarthritis, and trigger points secondary to strain resulting from altered weight distribution. A full workup including MRI and hip radiographs has not been pursued by the client therefore we cannot completely eliminate other possible conditions including spinal cord neoplasia. Treatments are performed using Seirin 0.16 x 15mm needles. Treatments included dry needling at lumbosacral points including BL27. BL28, BL35, and Bai Hui. Dry needling at coxofemoral points included GB29, GB30, GB31, and BL54. Dry needling at immunomodulatory points included LI11, ST36, and GV14. Support for renal function and digestive function were also included through dry needling at BL21 and BL23. The trigger points at the sternocephalicus, triceps, and sartorius musculature were also dry needled based on myofascial exam. We aim to keep the needles in place for 20 minutes, but of course this is determined by Buddy’s patience level at each session. Dry needling is followed with laser therapy focused over the lumbosacral spine and hips, using the MultiRadiance Class 1M 25W Superpulsed laser at 1000-3000 Hz for 2 minutes. Buddy’s treatment is currently ongoing once weekly, with 16 sessions performed thus far. Buddy has responded well to his treatments overall. With each reassessment his ataxia, hind limb weakness, and lumbosacral pain are persistent but stable. We feel that the acupuncture and laser are helping him to maintain comfort for a longer duration of time than he would have had without it. This is supported by the fact that no other treatments for pain have been added since the start of our sessions. There have been minimal adverse effects associated with Buddy’s treatments. His ataxia is often slightly worse immediately following the sessions, but he usually takes a short nap and then is reportedly stronger thereafter. We discovered that Buddy initially became increasingly active in the days following his sessions and tended to “overdo it”, leading to worsening pain and ataxia. The client has since been very attentive to monitoring Buddy’s activity and encouraging slow controlled exercise. At one of our earliest visits, I suggested using yoga mats to provide stable footing over the hardwoods, and the client placed them throughout the home. With this adjustment in environment, Buddy is experiencing much fewer episodes of slipping and falling which we think were exacerbating his discomfort. With Buddy, I’ve been lucky to have the chance to treat a patient so frequently and consistently. I’ve strengthened my ability to note subtle changes on myofascial exam, and I’ve also strengthened my ability to include these integrative therapies as part of a larger treatment plan supporting multiple ongoing problems. 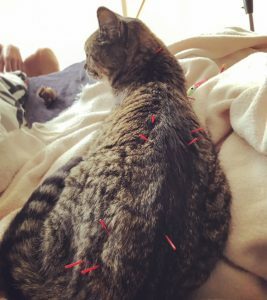 Especially considering the currently very limited options for pain management in cats, this case helps support that acupuncture and laser therapy are low-risk options that can be of great benefit to feline patients.